Summer is officially over. And Fall feels like it's coming to an end too with the snow that we just got over the weekend. I've been trending more towards warm hues like red, orange, and yellow, and fall appropriate shades like purple and olive. 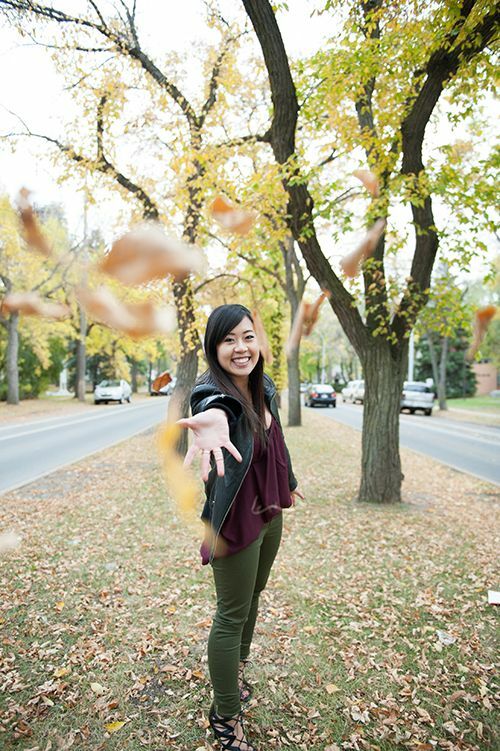 It's a shame that Fall is so short here in Edmonton...or I might end up saying it's my favourite season! 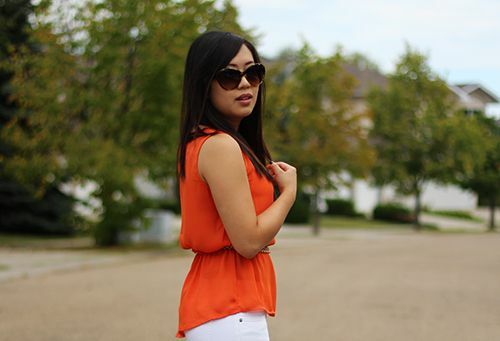 Orange is becoming a new fall favourite for me...from clothing, to lipsticks and blushes. 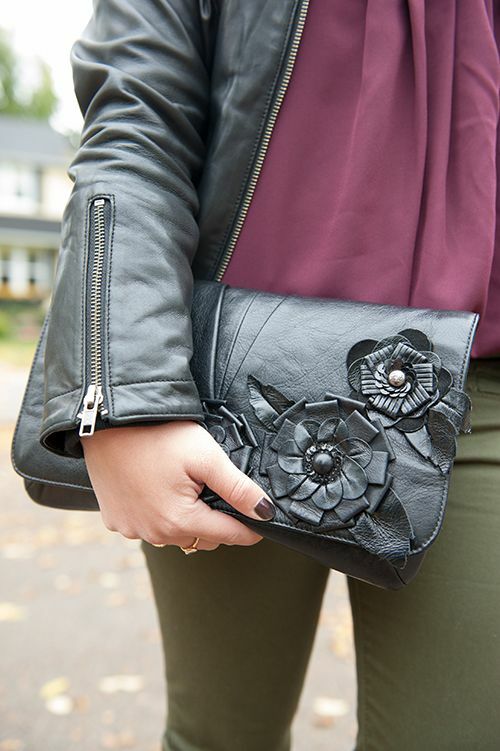 What's your favourite fall colour? Oh, and good news - Canadian retailer Dynamite has now launched their online store.. free shipping, fab clothing, and good deals. Make sure to check them out! On Monday, one of the local start up companies in Edmonton released a huge announcement in preparation for their first birthday. And today I want to introduce you to that company, and it is one whose philosophy I truly believe in and want to support. Say hello to Poppy Barley. I first heard of Poppy Barley last year when founders Kendall and Justine Barber announced that they were taking on this new project to make bespoke shoes. If you've followed this blog long enough, you might think I have lots of footwear. And I won't lie, I do, but that's because finding shoes that fit me well is a huge problem and many of my shoes don't fit my perfectly. I have to resort to other methods like using inserts or foot pads to make up for the extra space that is in my shoes so that I can walk around comfortably. When I find a pair of shoes that fits *just about* right, I'll buy it, and there's no turning back. Being petite has its perks, but also has its downfalls. Learning about Poppy Barley and it's philosophy really appealed to me because I've always had a problem finding footwear that fits. I stand at 4'10" with very small feet - I can fit into size 2.5 children's shoes, and usually cannot walk wearing a women's size 5 shoe without it slipping off my heel. Hence why I get pretty excited when a shoe actually fits. 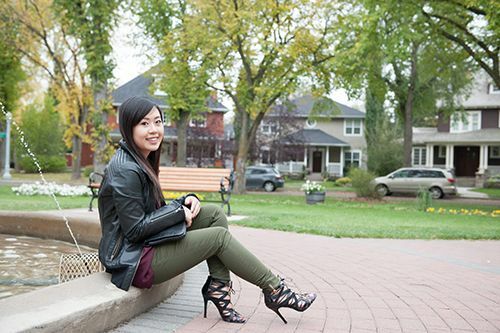 With Poppy Barley, they have a streamlined system for designing and ordering your shoes. 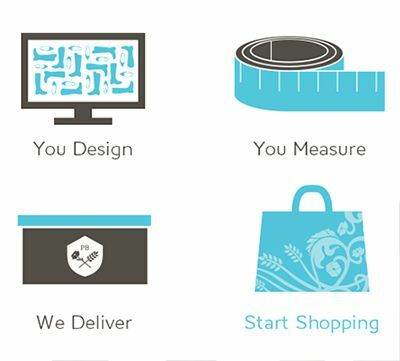 Design, measure, shop, and the shoes get delivered to you! As a local start up company, Poppy Barley has really made some pretty big strides in the footwear industry. Their brand has made me realize it's not just us petite ladies that have problems finding shoes - whether you've got runner's calves, high arches, long legs, or narrow feet, there's always a potential fit issue. Aside from believing that everyone should have perfectly fitted shoes, Poppy Barley believes in total manufacturing transparency. That means that not only do you know where your shoes are being made, but how it's being made, and the conditions that employees work under. So what exactly was this big announcement yesterday? In anticipation of their first birthday, Poppy Barley is looking to find six brand ambassadors to represent them as a company! How exciting is that? Poppy Barley is on a mission to revolutionize the footwear industry and I want to be a part of it. Having personally felt the struggles of finding the right shoe that fits, I want to spread the word and let other women know that their feet can be warm and snug inside a chic pair of custom made boots, or fun and free in a cute pair of fitted flats. The company is committed to finding comfortable, wearable, and fashion-forward shoes while providing employees with proper wages and safe working conditions - and that's something I think we all would want and can agree upon. I'm all for supporting local, and I'd love to see this company grow and attain greater success than it has in the past year. Good luck to everyone else applying to be an ambassador - I applaud you for backing up a company that is headed by founders so passionate in all that they do. There's a first time for everything. Yep. And this weekend, it snowed for the first time in Edmonton this season, and you can bet everyone was moaning and groaning as they tweeted their complaints and posted pictures of the small amount of snow on the weekend. I have a serious love/hate relationship with winter. I love the cozy sweaters and sitting by the fireplace.. heck, I even love the snow. What I absolutely hate is the cold wind and frigid temperatures. Ugh. It'll soon be time to sit back and endure the 6 month winter. Cold weather aside, I was going through my polish collection this weekend, and a bottle of polish caught my eye. 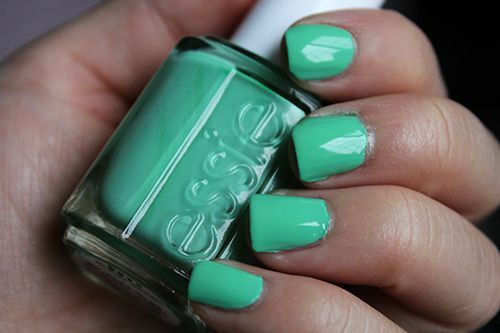 I definitely missed swatching it in the early summer, as Essie's First Timer is from the 2013 Resort Collection. Oops. 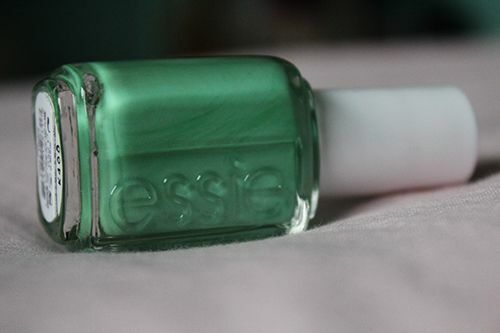 Anyway, I initially purchased this bottle online since it looked like another pretty mint polish to add to my growing collection. 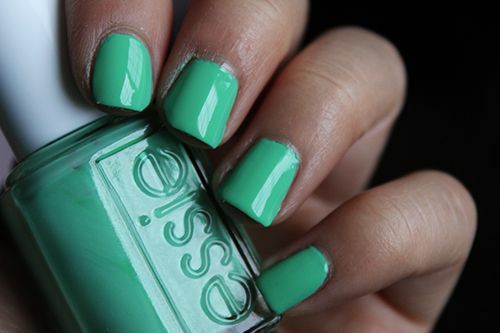 Unfortunately for me, this shade has more yellow in it, making it more of a green leaning mint. The formula is slightly thicker than what I'm used to, but the polish easily glides onto the nail and levels itself out wonderfully. 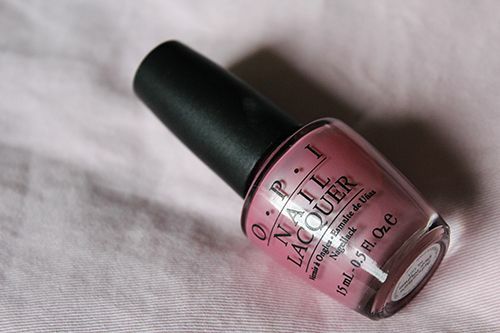 Dry time is quick, and the polish dries glossy before adding a topcoat. With up to four days of wear chip free, I'm a happy camper, but still wish it looked more mint on my nails! Shanghainese food has a dear place in my heart. I don't believe I've ever gone out to a restaurant and had it on my own. It's always been Shanghainese dinner with my family, and I associate awesome family dinners with Shanghainese cuisine. Weird association, but a good one if you ask me! About two weeks ago, my friend Diane informed me that Shanghai 456 was set to close around the beginning of November. 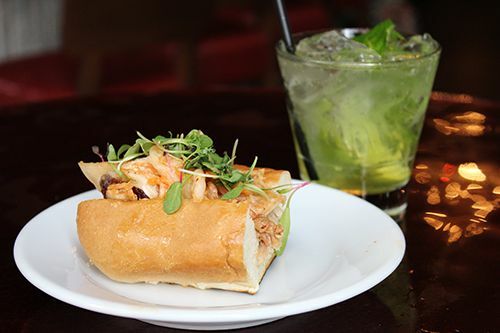 I've never gotten around to writing about their restaurant, but I'm hoping a lot of my readers can make their way to try them out before they're gone! 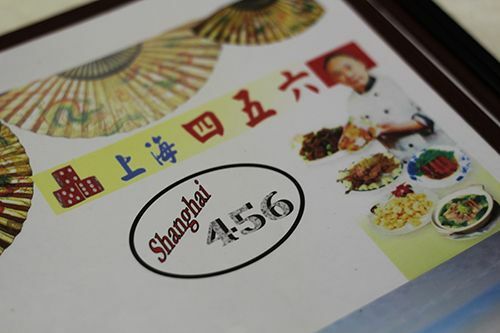 Shanghai 456 is a bit of a randomly placed restaurant, as it's located in the old cafeteria of the city centre airport. As the lanes at the airport are being closed down, all the vendors there are being forced to vacate. When you enter the building, you're inevitably hit with the smell of oil and greasy Chinese food. No word of a lie, as they work out of an open kitchen, so prepare yourselves for smelling like your meal for the rest of the day. It's got the 'hole in the wall' feel, as small model airplanes hang overhead of the tables and you're always reminded of where you are. 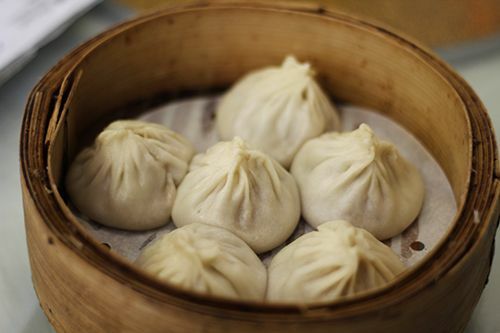 For any Shanghainese meal, you HAVE to order some Xiao Long Bao (XLB). 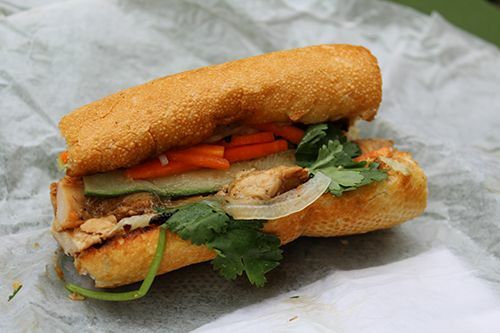 It's iconic, and always delicious. At Shanghai 456, their XLB (#A2. $6.95) come 6 in a steamer, wrapped beautifully and waiting to be eaten. Don't be fooled though, and let it cool down first. 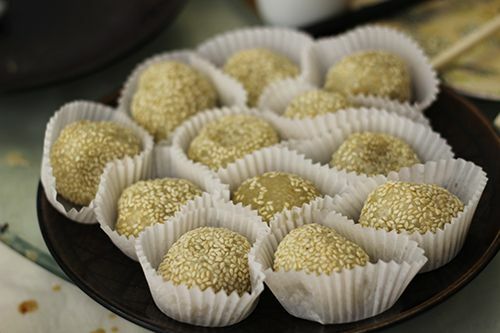 The worst thing is biting into the little dumpling and scalding your lips and tongue with the hot soup inside! Pick up the delicate dumplings and set them inside a soup spoon before biting into them, to ensure you don't lose any of the tasty soup. I find the XLB at this restaurant are the best in Edmonton, and not too far from what you'd find in Vancouver or Shanghai. The dough is thin, and the soup inside is plentiful and tasty, but it's cloudy with a prominent fattiness to the broth. Either way, if its the best I can get, I'll order them again and again. 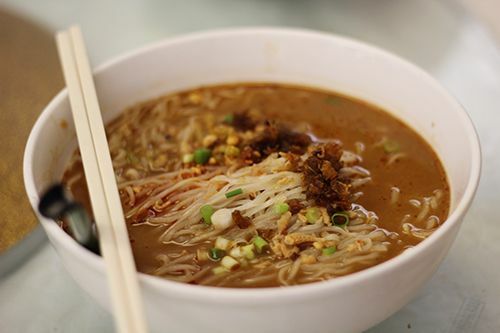 Another dish ordered was the Dan Dan Noodles (#D1, $7.95), which basically is a rice noodle in a spicy peanut broth with xo sauce. The dan dan noodles at Shanghai 456 are quite different from the same dish that my mother cooks up at home. The broth here is slightly spicy, with hints of peanut and a little sour, which really threw me off. The noodles were also a little overcooked, so I wouldn't order this again. Another Shanghainese favourite for me is Sauteed Rice Cakes (#D14, $10.95) with pork, chinese spinach & bamboo shoots. My favourite thing about this dish is the texture of the rice cakes, cause they're soft and chewy at the same time. They also do a great job of soaking up the sauce! When I cook this dish at home, it can be difficult as the rice cakes tend to cook quickly and attain mushy status quickly. Shanghai 456 made a pretty good version, but I was still able to find mushy rice cake pieces scattered throughout the dish. The Noodle Soup with Pork Chop (#D10, $7.95) (pork chop not shown) is a pretty simple dish that you can find all across Asia. It's featured in cafes and afternoon "tea" meals, and the version at Shanghai 456 is pretty good. Thick al dente noodles sit in a clear broth, with a panko crusted deep fried pork cutlet on the side. It's so satisfying biting into a crispy pork chop, then having a bite of noodles in hot soup. The House Special Hot & Sour Soup (#C1, $7.95) was something I was looking forward to trying out, cause I love anything spicy and sour. My dad makes an amazing version at home, so I was looking to see if Shanghai 456's version could compare. Unfortunately, their version had a hint of vinegar and just mild spiciness. 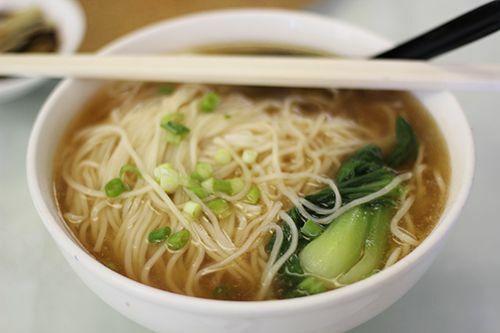 They use tofu, chicken, carrots, bean sprouts, green onion, bamboo, and wood ear as ingredients in the soup, and there's a relatively large proportion of ingredients in the bowl of soup. If the flavours were truly representative of what a real hot & sour soup should be, I'd recommend it. Shanghai Noodles Sauteed with Pork & Vegetables (#D13, $9.75) is another dish that people tend to associate with Shanghainese cuisine. 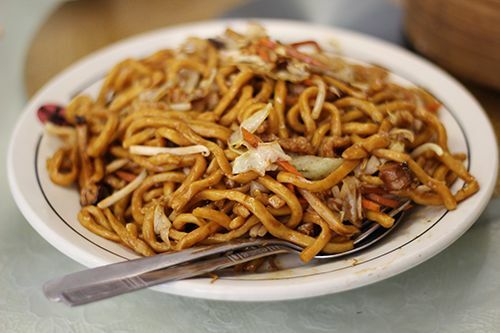 Thick noodles are stir fried with bean sprouts, carrots, cabbage and pork, and the flavour often comes from soy sauce and hoisin sauce. 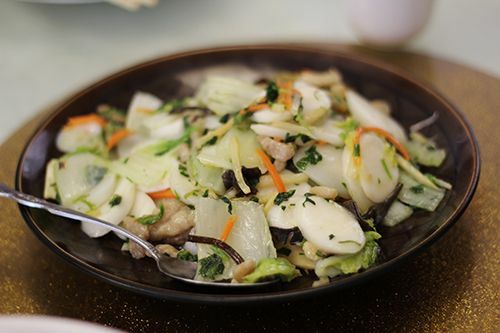 The version cooked at Shanghai 456 is nothing exciting - it's a simple dish and tastes just like all the other versions cooked up in Edmonton's Chinese restaurants. Last but not least, I have to talk about is Pan Fried Dumplings - otherwise known as Wor Tip (#A3, $7.50). 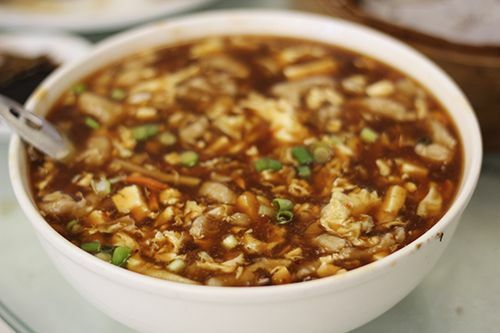 Yet another iconic Shanghainese dish, the wor tip made at Shanghai 456 are delicious. 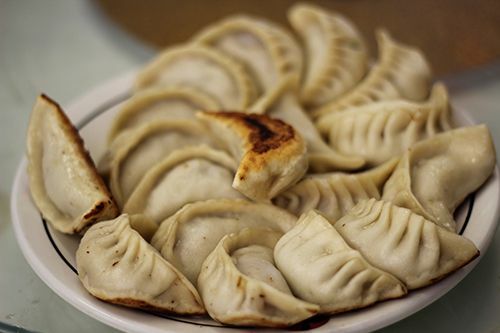 Similar to a xiao long bao, wor tip dumplings are filled with a bit of soup, so proper eating etiquette includes taking a small bite and sipping the hot soup out before consuming the whole thing. They're pan fried to get a nice crispy skin, and are an alternative to XLB for anyone that can't eat pork! 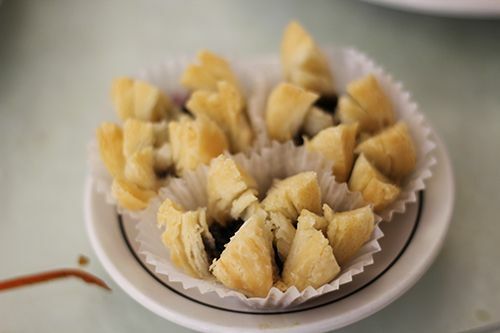 The Lotus Blossom (#A16, $3.25) is a flower shaped puff pastry filled with black sesame paste. I've recently started to fall in love with the rich flavour of black sesame, and this dessert did not disappoint. Layers of delicate puff pastry and the slightly sweet black sesame paste was the perfect end to the meal. I've been spoiled with good Shanghainese food in the past, having dined in Shanghai & always getting my fix on trips to Vancouver. But it's so hard to find good Shanghainese food in Edmonton, let alone Alberta, so I like to get my fix from time to time at Shanghai 456 in order to fill those cravings. 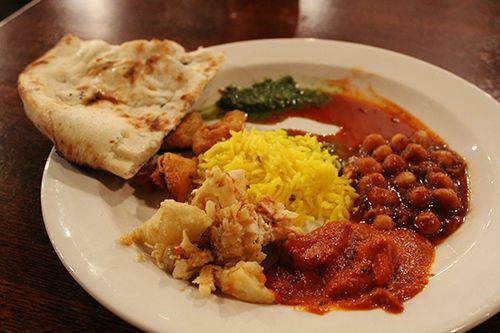 The food isn't perfect, but the portions are great and the prices are affordable. Although Shanghai 456 is on the road to closure, I would recommend going out to give them a try before they're gone. If anything, definitely try out their XLB, wor tip, rice cakes & lotus blossom. The owners are planning on going on vacation after they close, and will hopefully return to open a location elsewhere.. but who knows how long that could take? Let me know if you give them a visit! Everywhere I go, I get complimented on my skin. It's all the old Asian ladies telling me I have a great complexion and they ask me what beauty products I use. But contrary to popular belief, I do get dry skin in the winter time, and I get the occasional breakouts. It's all about finding what products work for you and sticking to them. Recently, I've been having breakouts around my mouth and chin, and unfortunately it's left me with dark spots that don't fare well for my self esteem. Don't get me wrong, I'm all for natural beauty, but deep down I think all of us girls have some insecurities about our skin and this is mine. Dark spots and scarring. So I did a bit of research to see what was out there, and went through numerous user reviews for different products on the Sephora website. I wanted to find a product that people reported worked for them, but I also didn't want to pay the huge price tag for something that may not potentially work for me. 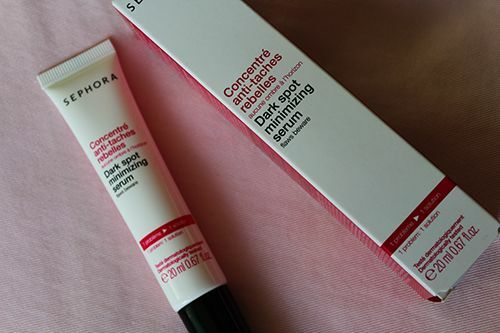 Here's where the Sephora Collection Dark Spot Minimizing Serum comes in. For me, I've had some great results with the Sephora Collection skincare line, and this serum looked pretty promising after reading some reviews. For $24 CAD, I was getting a decent amount of product without having to pay the $50+ price tag that many dark spot correcting formulations have attached to them. Looking at the applicator, it's pretty simple. 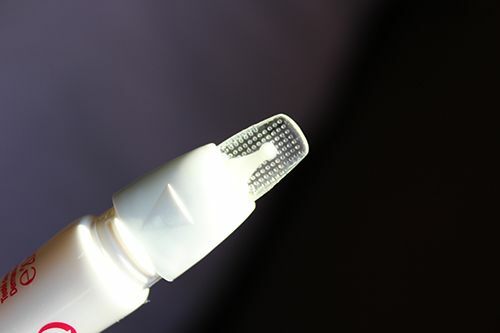 Squeeze the tube to dispense the amount of product that you want from the smooth side, apply, and flip it over to utilize the 'exfoliating' side to rub the product into your trouble spots. 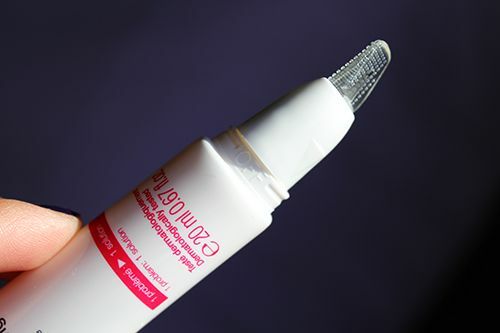 What I love most is that the applicator can turn 180 degrees so that you can close off the dispenser to ensure no product comes out while you're rubbing it into your skin. Genius! 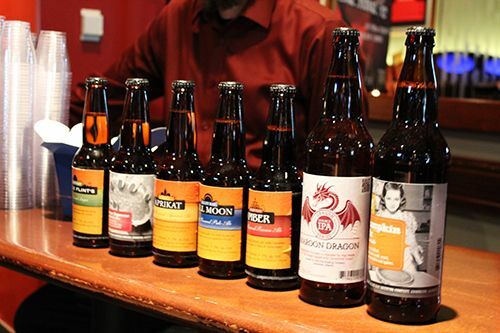 Liquor Depot will once again feature an on-site liquor store, where attendees can purchase their favourite finds from the night. Liquor Connect will also be available to demonstrate how liquorconnect.com can help find sensational sips after the Festival. Additionally, Sunshine Village will be sponsoring the Grand Prize All-Inclusive Weekend Getaway including two nights accommodation at Sunshine Mountain Lodge, VIP parking, $100 gift certificate for food and beverages, a couple’s spa treatment and next day lift tickets. As last year was my first time attending, I was pretty impressed with what the festival had to offer. The halls inside the Shaw Conference Centre were packed - that's an understatement. 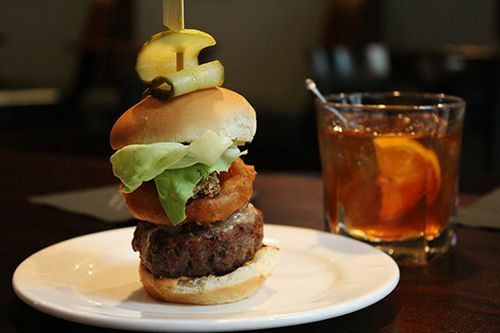 So many great restaurants are being featured and I can't wait to try some of the items out. Heads up - my favourite yellowtail is available for sampling from Japonais Bistro! Mmmm. 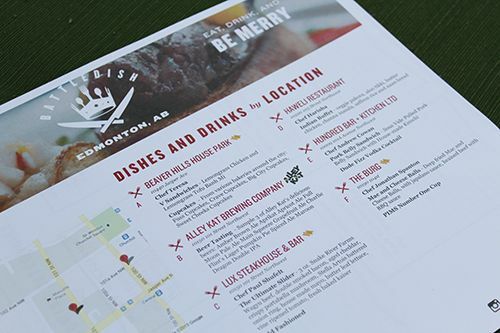 Take a quick peek at the festival menu! The event is a ton of fun, and I want to make sure you can get in on it too. I have been given two pairs of tickets to give away to two lucky readers for two different days! I have one pair for the Friday night tasting on October 25 from 5-10PM and a pair for the Saturday afternoon tasting on October 26 from 12-4PM. The tickets will gain you entrance to the event, but tasting for the food and wine will cost coupons, priced at 50 cents each. - Let me know which session you would like to attend in the widget below! Giveaway opened to individuals 18 years of age and older. Please note that this event will NOT allow minors - not even if you are bringing an infant along with you. Winners will be chosen by random and announced on October 23rd. Good luck! 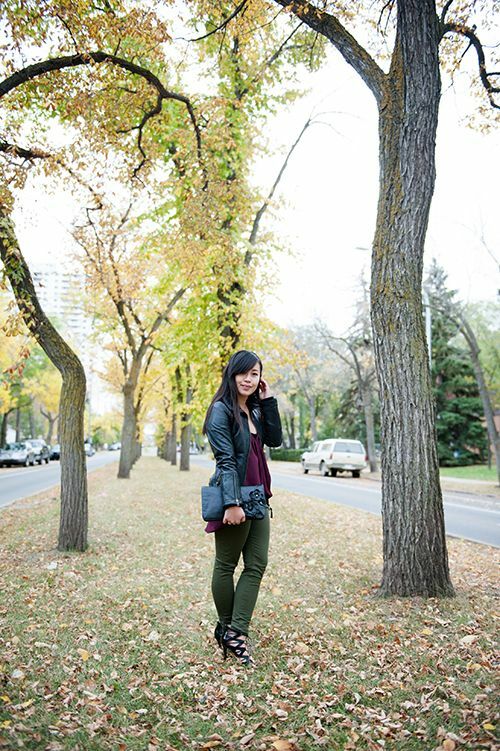 Fall is in full swing in Edmonton, but I'm still trying to fit in those odd chances of wearing skirts when the sun is shining. Don't be fooled though, the sun is deceiving and it's actually pretty cold outside, hah. 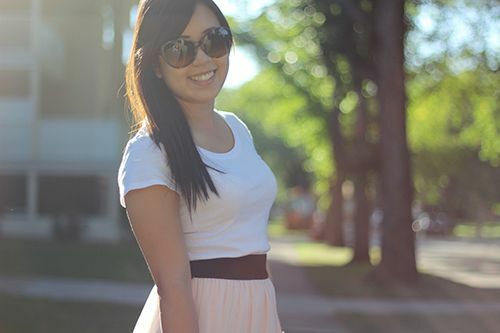 I lived in quite a few high-low skirts this summer, and I just love the silhouette as it's so easy to style. It can be worn casually or dressy depending on the print, and I'm sad to say bye to my skirts as the days get colder. 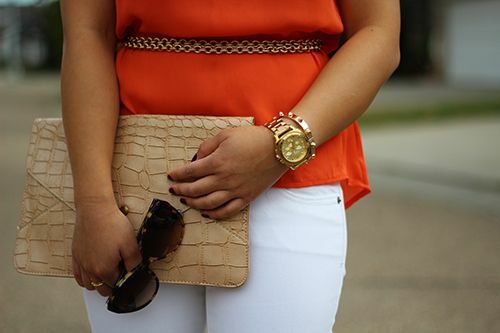 But hey, I love the colours of all and all the fun with layering that can be done in the cooler temperatures! 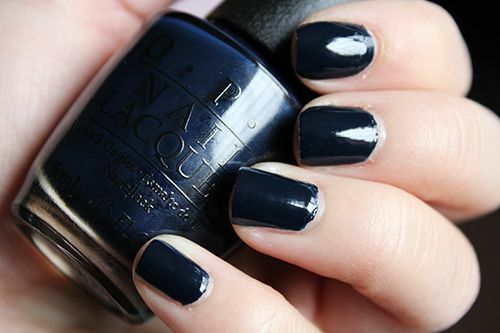 Returning back to fall nail shades, this week I have Incognito in Sausalito, a beautiful deep blue shade from OPI's San Francisco collection for Fall 2013. Upon seeing swatches on the internet, this was a must have shade for me. 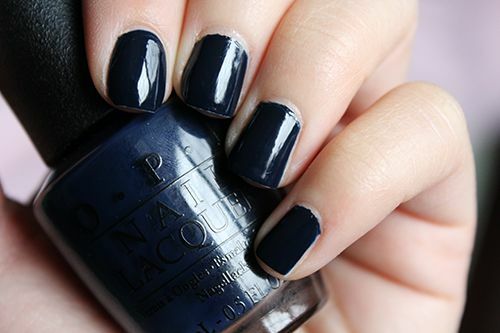 This deep hue is what I like to call an almost-black blue. 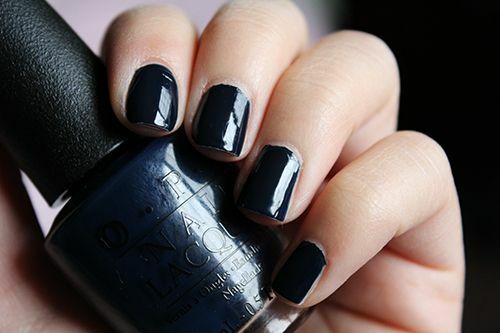 To most eyes, it seems like a black polish, but when examined closely, it's a deep blue - but does not cross into the territory of a navy blue. The colour is beautiful when seen infront of your eyes, and the formula is incredible. The polish just flows right onto the nail, self levels, and dries ever so quickly to a shiny finish. The colour lasts a full 4 days before chipping, and the only downside is that it still has the tendency to stain nails despite using a top coat. But trust me, it's worth it! Back in September, State & Main opened and it is now the only full-sized restaurant located in the mall. With the constant renovations and "facelifts" being made to Southgate, State & Main has the right amount of flair to fit right into the modernized shopping centre. 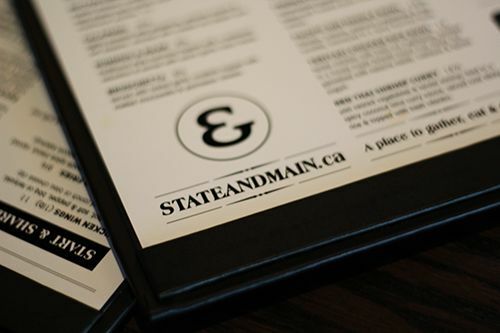 State & Main is actually a new Alberta-based chain restaurant with locations already in major cities like Calgary, Lethbridge and even Saskatoon and Winnipeg. My boyfriend and I decided to stop by for a quick lunch on a Thursday around 12:30 and were actually surprised by the number of people in the restaurant. While I understand State & Main is located in a shopping centre, not many employees have a long enough break to have a sitdown lunch at a restaurant, and malls aren't very busy during the early afternoon. It's great to see that they're getting lots of business though! When given the menu, I couldn't help but feel a bit overwhelmed by the number of options. There were so many different dishes available, and multiple potential sides with every dish. 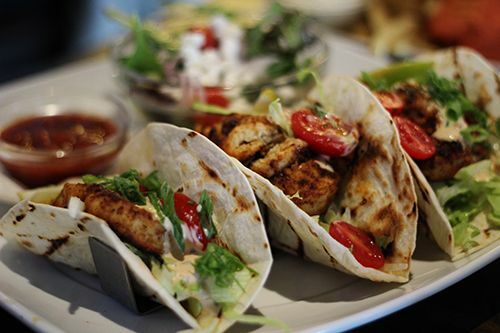 Eventually, I settled on the Long Beach Fish Tacos ($16/3 tacos): lightly spiced mahi mahi, avocado, shredded lettuce, tomato, green onion, chopped cilantro & fresh lime. Served with a mixed green salad. The waitress was kind enough to ask the kitchen to omit the cilantro from my dish, so the tacos were pretty tasty. The pieces of fish were flaky and substantial in size, and adequately seasoned so as not to taste fishy. The vegetables were fresh and tasted great inside of the lightly grilled taco. The side salad was a nice way to lighten up the dish, but I found the vinaigrette to be quite acidic, and wished it could have been less sour. My boyfriend went with the Chicken Club Wrap ($13.50 w/ 2 sides): oven roasted chicken, peppered bacon, aged cheddar cheese, avocado, tomato, mayonnaise & crisp shredded lettuce. The price included two sides, and he chose french fries and a quinoa salad. 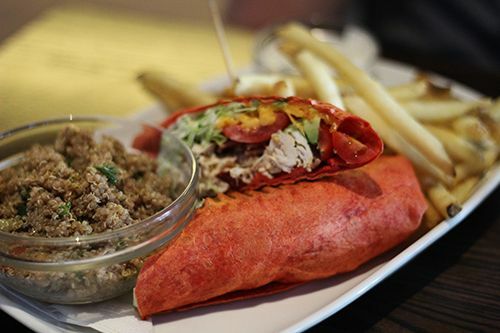 The wrap itself was grilled crisp, encasing the fresh veggies and cooked chicken, but the bacon was quite predominant, overpowering the other elements in the wrap. The fries were delicious, almost like they were coated with batter first before they were fried to ensure they would be golden and crisp. The quinoa salad was served cold and sweet, with hints of balsamic. As the sister restaurant to Original Joe's, the similarities in their menu and food presentation at State & Main was readily apparent to me. I can't get over it, and just have to say that it just feels like an upscale Original Joe's. 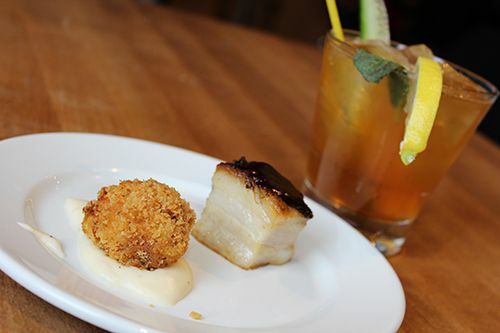 The food is good, but many dishes are well-loved favourites, meaning there's nothing new and exciting on the menu. 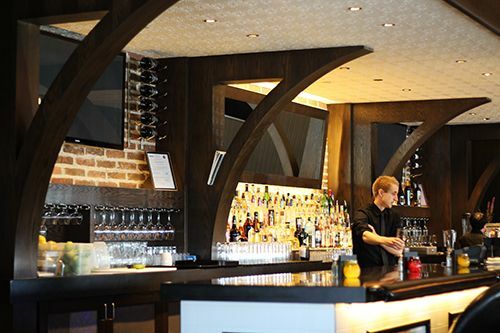 It's a nice place to go for casual lunch or dinner, as the atmosphere is relaxing, and the service is quick and friendly. 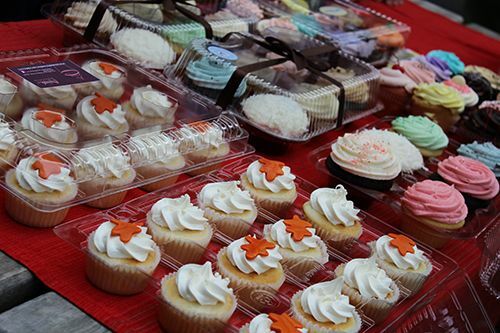 Check them out on your next shopping trip to Southgate!